In the Higo Variety Store near 6th Ave.S. and S. Jackson Street, the Kobo Gallery holds modern decor in Japanese crafts and textiles and unique gifts of art. I’ve wanted to include Kobo on my walking tour but it is a few blocks way from my usual swing through Uwajimaya, (Asian grocery/gifts) and Kinokuniya bookstore on Lane St. If you visit Kobo at Higo, be sure to take-in the display about the Murakami family who owned the original 10 cent store. 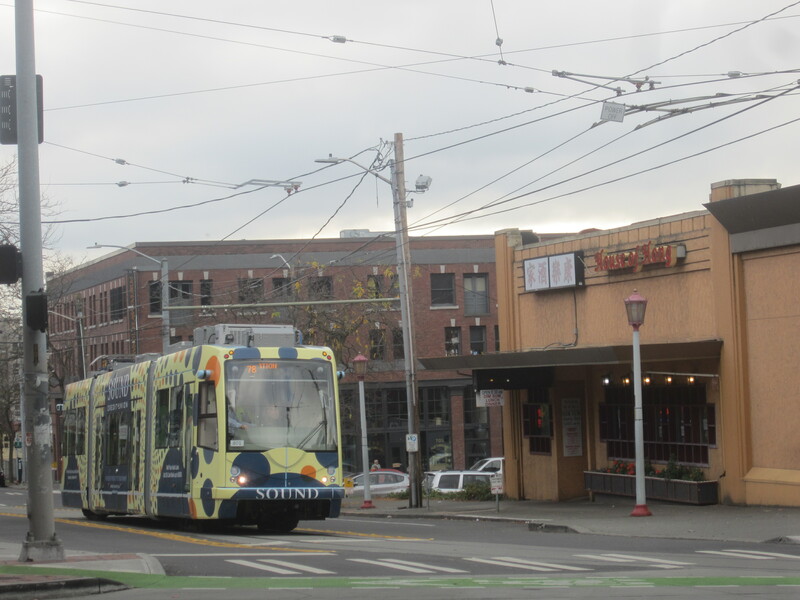 From Higo, uphill on 6th Ave. S., Maneki, the oldest Japanese restaurant in Seattle is in the NP hotel building. It’s opens in the evening, and is very popular for sashimi and sushi. At the corner of 6th Ave S. and S. Main street, turn right to find the Panama Hotel at 605 1/2. The tea and coffee house has counter service numerous tables for a relaxed visit. Interesting historical photos and displays remind visitors of the busy Japantown that was here in the mid 19o0s. A plexi-glass view through the floor shows some of the belongings left behind by Japanese-Americans who were sent to internment camps under Executive order 9066. (issued Feb. 19 1942, a few months after the attack on Pearl Harbor 1941).The novel, “The Hotel on the Corner of Bitter and Sweet,” tells a story about a young Chinese boy and a Japanese girl during this time of racism, and the unfounded fear of spies and sabotage by the Japanese on the west coast. Among real lives, the Murakami family who owned Higo, and Mr. Takashi Hori who owned the Panama Hotel were sent to the Minidoka camp in Idaho. The Moriguchi family, who started Uwajimaya, were sent to Tule Lake in northern California. Although some of the businesses resumed after the WWII, Japantown didn’t recover in population. In April 2015, the Panama Hotel was given “national treasure” status by the National Trust for Historic Preservation. Its story helps us remember what happened here. Across S. Main Street from the hotel, the terraced walkways of Danny Woo’s Community garden are bordered by many small fenced plots, and fruit trees, and chickens . And at the top of the stairway, Kobe Terrace Park awaits on S. Washington Street. Seattle’s first “sister-city” relationship began in 1957, and the tiny park has Cherry trees, and Japanese pine that were gifts from the city of Kobe. A stone lantern was placed with a 1976 dedication “to shed light on the friendship” of our sister-city. In present-day Seattle, Nihonmachi, our Japantown, is a place to remember, and rediscover. 2016, Is it still raining? Yes! and there’s snow in the mountains– where it belongs. With each New Year, I find it more difficult to put the old year away. It’s a sad day pushing the dried-out Christmas tree, and crispy cedar boughs into the yard. We age our old tree and later cut it up so it’ll sizzle and pop in a summer fire pit. And inside, we’ll have the company of sharp fir needles under cushy chairs and carpet edges throughout the spring, no doubt. It’s a melancholy time for many reasons. Holiday treats and special foods are recent memories, as is our happy football season. But enough! We have to look forward. Need some cheering? Go to Georgetown! I love the vibe of this neighborhood, and anybody who has played rec. soccer likely has been distracted by planes flying closely overhead. While on the astroturf, I can’t NOT look up, they are just above your head! Then, a re-positioning BN train comes creeping along with its whistle blasting, only to stop and reverse itself silently. Before it was annexed to Seattle in 1910, Georgetown was its own little town on the Duwamish river among the native Duwamish people. White settlers here pre-date the more famous Denny party. Historylink.org provides a summary that includes the local Duwamish being pushed out by private land claims as the settler population grew. Farmers grew hops in the river valley, and brought the success of the Seattle Brewing and Malting Co. (later becoming Rainier Beer). Railroads expanded, and landfills completely re-engineered the bending river at the turn of the century. Boeing field began its service for King Co. in the 1920s with the Boeing factory nearby booming into a huge industry. Then, in 1962, I-5 cut into Georgetown further chopping the little town in segments between the various ramps, and industrial arterials. The current Georgetown has restaurants, shops, great beer and coffee, live music venues, and the Art Attack (2nd Sat each month) within a few blocks. When you go there, bring your real friends– not everybody you know, but just a few who can slow down, and know how to enjoy a rainy January day in Seattle. Posted on January 20, 2016 January 24, 2016 Leave a comment on 2016, Is it still raining? 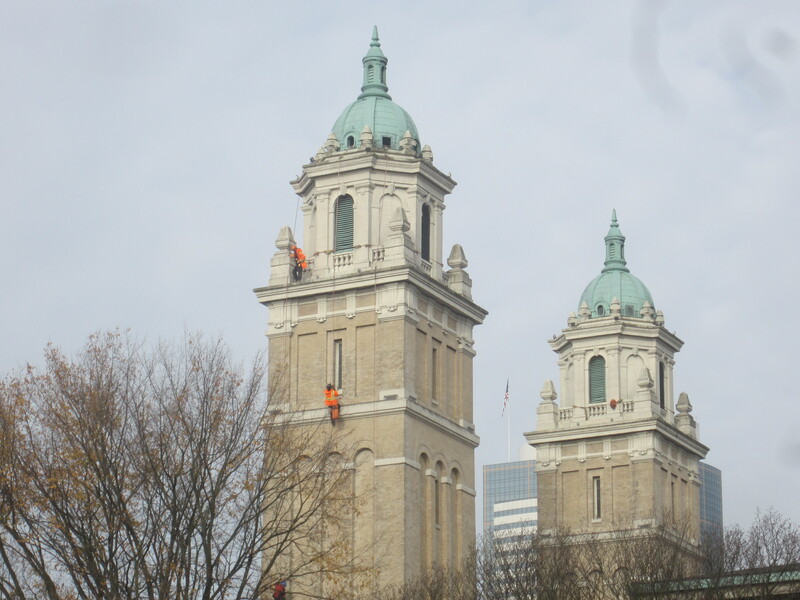 These orange-garbed workmen are adding lights to the exterior of the towers at St James Cathedral on First Hill. The project began at the end of the summer, and should be completed by early December. The theme of this renovation is ‘Place of Light, Place of Welcome,’ and it’s right on time with a needed hopefulness to get us through the long, gray days ahead. In the early 1900s, St. James was a landmark on First Hill, but now it’s somewhat hidden in the increasing skyline of towers. From the waterfront, the dark heights of the Columbia Center often block the view. The new lighting system will illuminate the beautiful cathedral structure as well as add to the safety of those walking along on 9th Ave. 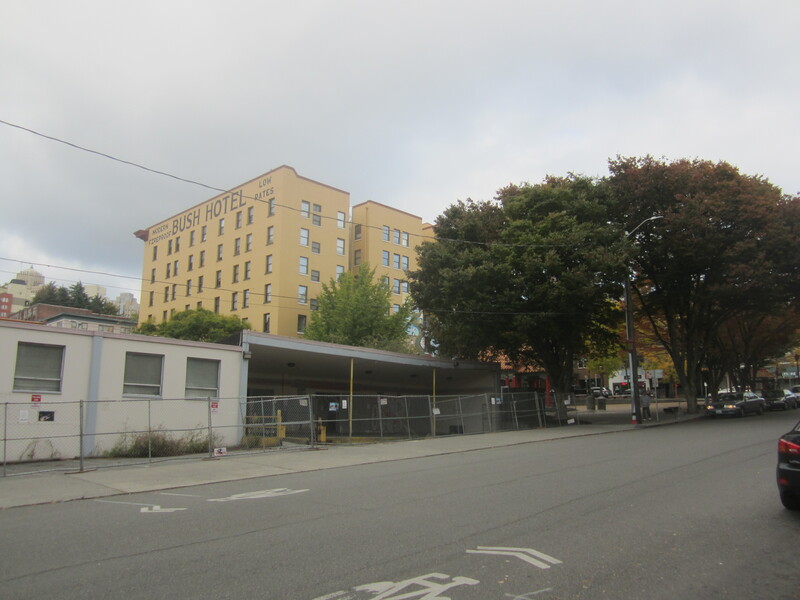 Earlier this year, the Chinatown post office closed, and moved to a tiny corner on Jackson St. so that a Seattle Parks and Rec. project could begin. While I miss the room of the old USPS clerk’s counter, I like how the new park design expands Hing Hay Park into two city blocks. The artistic landscaping includes terraces and performance areas. It’s sure to welcome more people who enjoy open walk-able places year-round, and it’ll be a great setting for festival times. We’re easing into the cooler season, and our weather predictions include “scattered showers.” This is one of my favorite types of days in Seattle. Scattered showers mean it will be warm, and then it will rain lightly, and then it will be warm again. This is different from ‘”partly sunny with precipitation” (cloudy), or the more straightforward prediction of “showers likely,” (cloudy). Scattered showers give a whimsical randomness about where rain will fall. It allows a precise question as to where the clouds were during your day. With “scattered showers” you can take it personally. This September condition, rain clouds followed by sunshine, is quite brief, and full overcast is on the way. A favorite destination when I’m among scattered showers is the downtown Seattle Central library. Autumn lighting makes its own show upon, and inside this ultra-modern building. The Central Library is a wonderfully strange-looking aluminum mesh and glass building designed by Rem Koolhaas. It opened in 2004, and the reflections on the exterior, and patterned shadows on the interior make for a futuristic, flexible environment. It has few traditional walls or ceilings, and the natural light fills the massive structure with an open, comfortable feeling. But the neon shaded escalators, and a curving blood-red 4th floor hallway offer a challenge–don’t get too comfortable, things are happening here. I love that the library has room for activities as well as traditional book and media resources. Citizenship and ESL classes, afternoon story-time, computer classes, author readings, music, and film, and a variety of lectures are hosted in library meeting rooms, performance arts areas, and the auditorium year-round. In contrast, I also love the library’s 10th floor because it is a very quiet place. When were you last in a quiet public place to read, or write? It sounds as if it should be an easy thing to find, but I go to this floor because it is silent. I tip-toe to the desks in the study area. My reading attention stays focused so my imagination can take-off. It’s a wonderful space especially during an afternoon with scattered showers. Library entrances are on 4th and 5th Ave (between Spring and Madison Streets) It’s a hike uphill from 3rd Ave. transit. Sometimes I start a few blocks north at University St. Station to avoid the steep incline. I’m not alone in trying to avoid hills–perhaps it’s a Seattle thing? At 2 p.m. 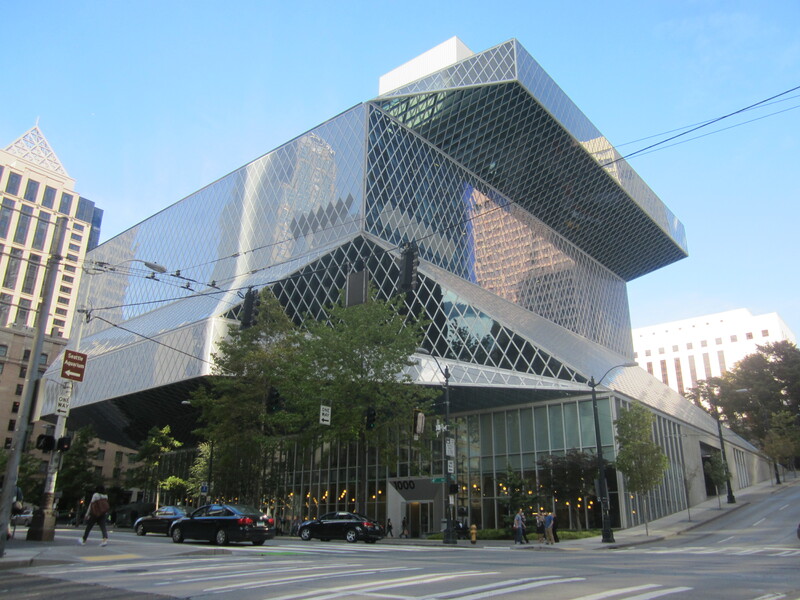 Sat., Oct. 10th, the Seattle Central library is hosting an interview with David Williams, author of “Too high, Too Steep; Reshaping Seattle’s Topography” I read it’s about the different re-grade projects that allowed for certain types of Seattle development. The interview is in Microsoft Auditorium. Check the website Seattle Central Library to learn more. This is the last day of summer and with the Autumnal Equinox comes the celebration of our wedding anniversary! Today, I walked to the Pike Place Market and it is a joy to be there on a Tuesday afternoon. I had lots of room to see the produce, enjoy a sample of a perfectly ripe mango, and also a large purple grape? I saw plenty of people downtown, but not many crowded walkways or strollers at my heels today. Also, The President of China is visiting Seattle, and traffic is supposed to be terrible. But if you’re walking, just stay away from the Westin Hotel, and soak-up the sunshine. 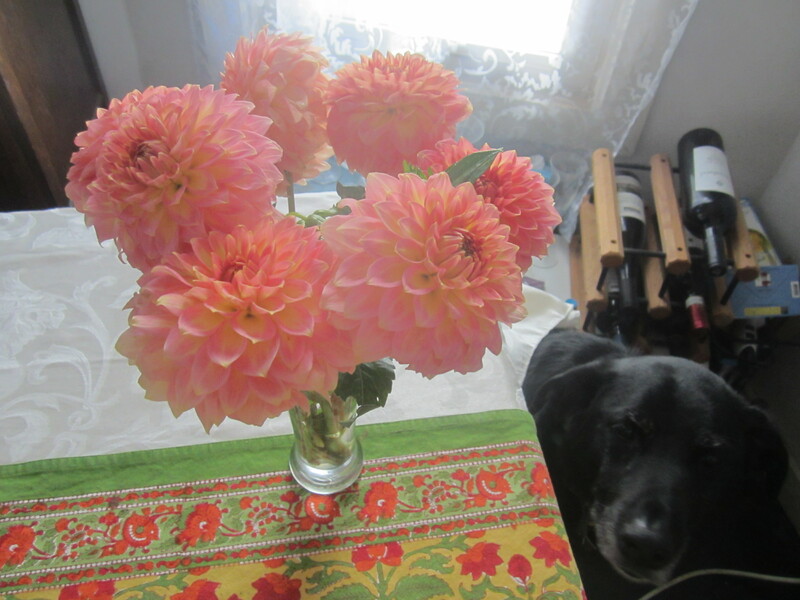 And, if you get a chance to get to the market this week, enjoy the dahlias–a beautiful flower for a celebration.